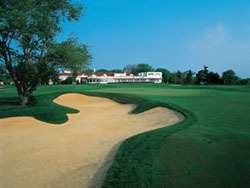 The Atlantic City Country Club is one of America's oldest and most prestigious golf clubs. Six USGA championships have been played at this legendary course. 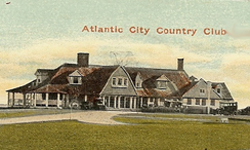 The Atlantic City Country Club opened in 1897, and for most of its life it was a private club. It is now owned by Harrah's Entertainment Inc., which has four casinos in Atlantic City. While Harrah's maintains the golf course mainly for its casino patrons, it has also been open to the public since 2007. The golf club is steeped in history. Numerous famous players have played there including Hale Erwin, Fred Couples, Ben Hogan, Arnold Palmer, Bobby Jones, Don January, Babe Zaharias and Sam Snead. Arnold Palmer practiced there from 1951-1952 while he was stationed at a nearby Coast Guard station. 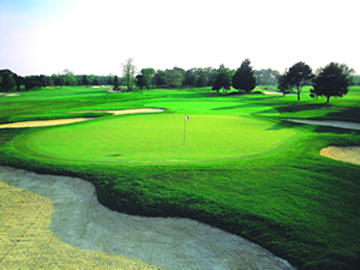 The first professional senior tournament was held there in 1980. Don January was the winner, and after the tournament Sam Snead entertained with his trumpet. The first three USGA Women's Opens were held there. All three were won by Babe Zaharias, who played the piano in the bar after one of them. The term birdie, for a score of one under par, was coined at the club in 1930. Johnny J. McDermott, who won the 1911 USGA Open Championship when he was only 19 years old, was once the pro at the club. Many famous celebrities including Joe Lewis, Willy Mays, and Joe Namath have played there. Bob Hope who often performed in Atlantic City, was a regular at the course. Celebrities still head for the course when they come to Atlantic City. Julius Erving, Roger Clemens, Kenny Rogers and Madonna played there, and also Joe Pesci and Robert De Niro. The golf course's 6577 yard routing traverses flat coastal terrain reminiscent of links in Scotland and Ireland. 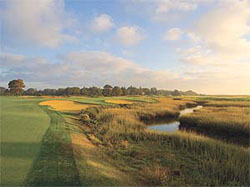 Many of the fairways are bordered by water and salt marshes. 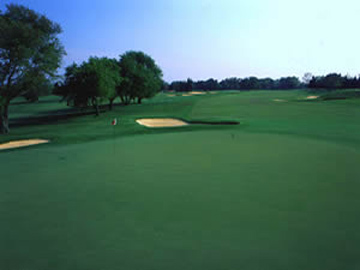 The course has a tradition of fast, firm greens. There are great views on many of the holes as much of the course goes right along the intercoastal waterway. Hole No. 14 has a tee box that is on an island from which you can see the Atlantic City skyline. The original architect was John Reid and Willie Park Jr., however the course was renovated in 1999 by Tom Doak and Bruce Hepner. 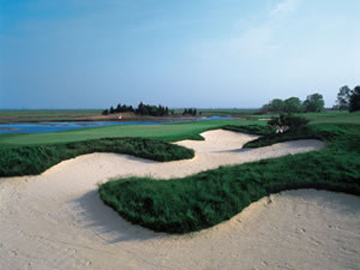 In 2008 Golf Magazine included the Atlantic City Country Club in it's Top 100 Course You Can Play list. 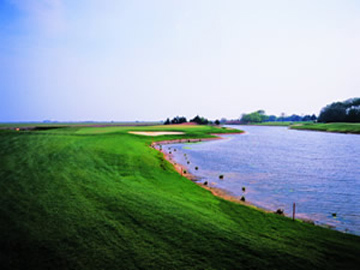 In 2007 the Atlantic City Country Club was ranked #7 in the State of New Jersey by Golf Digest, including private courses. In 2006 Golf Week Magazine rated the Atlantic City Country Club the #1 Public Daily Fee golf course in New Jersey, and one of the top 100 classic golf courses in the country. The course yardages are from 6577 to 5249 yards, with 3 sets of tees allowing golfers of all skill levels to enjoy the course. See scorecard below. 19th holes. 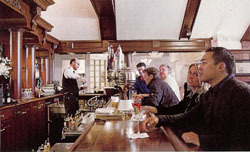 The bar has a classic dark-wood bar and the original wood flooring, complete with spike marks. Executive chef Brian Clotworthy provides the food, which features steak, prime rib and the freshest seafood, including his signature Clotworthy Classic Crab Cakes. The Sunday Brunch at the club was recently named the No.1 brunch in South Jersey by Philadelphia Magazine. The Tap Room is a living museum. The walls of the bar are covered with interesting photos and memoriabilia. The bars bay window provides a panoramic view of the golf course, lakes, bay, and the Atlantic City casinos. Golf fees at the Atlantic City Country Club vary from $65 to $180 depending on time and season. Call the pro shop for specific rates and reservations. The Atlantic City Country Club is located at 1 Frazer Drive in Northfield, NJ 08088, just a short drive from Atlantic City. From Atlantic City follow Route 30 - White Horse Pike north to the Delilah Road exit ramp. Follow the ramp to Delilah road. Turn left at the first light onto Main Street which turns into Shore Road in Northfield. The club entrance is on the left approx. 3 blocks past the County Stillwater facilities building. See map below. More and Larger Photos of The Atlantic City Country Club are shown below.